200 metres to beach boat access. Converted 2 storey double garage. Ground level living area with large sliders to outside grassed areas, beds upstairs for 8. Utility shed for cooking and large outside table for evening dinners under the stars. Section fully fenced with room for tents, boats or a game of volleyball. Please note that the 'bedrooms' are a single communal space with a solid partition wall extending part way down the middle, not sound proof but some privacy for the queen bed away from the others. Our family loved staying here and will be back again. Awesome location, close to the beach and the shops, a lot of outdoor space. 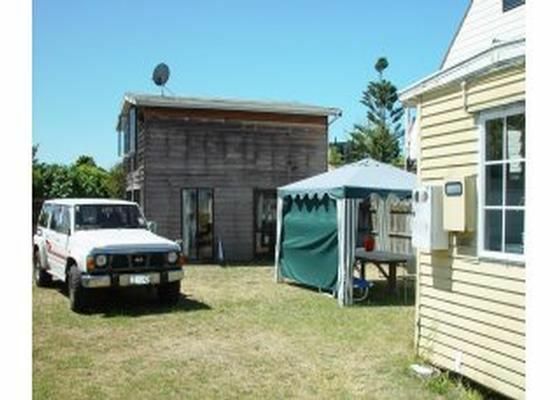 Awesome location, close to the beach and the shops, a lot of outdoor space. The kitchen utility and accommodation need a LOT of TLC. Outside tree was nice for bit of shade. Approximately 200 meters from the beach and shops.